This drawing illustrates a cervical nerve root that is being compressed by a disc prolapse. 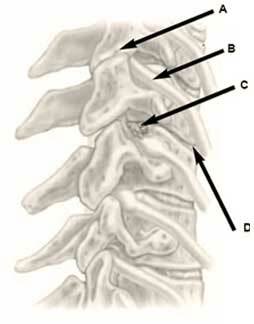 The facet joints (A) form the roof of the canal through which the nerve root (B) runs on its way to the arm. The slipped disc (C) is pressing directly on a nerve root and this can cause pain, pins and needles and ultimately weakness in the arm. The intervertebral disc (D) acts as a shock absorber between the vertebrae. The spine consists of a series of vertebrae that are stacked on top of one another from the neck to the pelvis. These vertebrae are connected and kept in the correct position by the discs that are between the vertebrae and also the facet joints that interlock with one another. There are also supporting ligaments and tendons. The discs between the two adjacent vertebrae are composed of a central, soft, jelly-like substance called the nucleus pulposus and an outer, tougher fibrous part called the annulus fibrosus. In some cases the tough annulus fibrosus may tear, leaving a defect in the strong outer layer. A bit of the nucleus pulposus can then push through this tear and end up in the spinal canal and press against the nerves in the spinal canal. This can be caused by a traumatic injury, but is usually due to an inborn predisposition towards weak discs. When a part of the nucleus pulposus pushes through (herniates) the annulus fibrosus it is called a slipped (herniated) disc. Compression of the spinal cord is very dangerous and can lead to paralysis. One of the earliest signs of impending paralysis is very brisk reflexes when the specialist taps your knee or elbow. Compression of a nerve root may lead to pins and needles, pain and weakness of that part of the arm and hand which is supplied by that specific nerve. See the description of dermatomes in the section Neck Pain. When the part of the nucleus that herniated compresses the nerves in the spinal canal, you may experience neck pain and pain in one or both arms. Some people experience pins and needles in the hands. Pain and discomfort may also be sensed in the shoulder, between the shoulder blades or at the front of the chest (thorax). At a later stage, weakness in the arms and hands may be experienced. A clinical examination by your specialist or therapist will allow for a reasonable suspicion, but the only definite way is by doing a magnetic resonance imaging (MRI) scan (see the section Tests and Scans). Sometimes, because of technical factors, a CT scan is performed (see the section Tests and Scans). This is usually when an MRI scan cannot be performed due to the unavailability of an MRI scanner, when there are contra-indications to doing a scan or when technical factors such as the presence of certain metal fusion apparatus in the spine, make an MRI scan unreliable. See the section Tests and Scans for the terminology that you will find on your MRI scan report and what it means in plain English. Other tests that might be used are discograms and nerve blocks. Sometimes EMGs are also used (see the section Tests and Scans). No treatment – This is acceptable if there is no serious nerve compression – therefore in the absence of spasticity or muscle weakness. There is a certain proportion of patients who will get better without an operation within the first six to twelve weeks after onset of the first symptoms. Non-invasive treatment – The initial treatment for a cervical disc herniation is conservative treatment that might include anti-inflammatory medication, analgesic medication, physiotherapy and other manual treatments such as chiropractic treatment, pressure point therapy, massage therapy, traction and other therapies. This would usually be followed for a period of at least six weeks. Semi-invasive – These include procedures like radiofrequency rhizotomy (see the section Cervical Radiofrequency Rhizotomy) for the treatment of facet joint mediated mechanical neck pain and Nucleoplasty (see the section Cervical Nucleoplasty) for the treatment of discogenic pain. These treatments may be highly effective, have very few side effects or complications and are performed as day procedures. These procedures have a very definite place in the non-surgical management of cervical disc disease. If conservative management is unsuccessful, then surgery is usually indicated. In situations where there is muscle loss or sensation loss due to a compressed nerve, surgery is considered much sooner. Compression that continues for too long can cause permanent nerve damage. The longer the duration of the symptoms, the smaller the chance of success when operating to decompress the nerves. 1. Failed conservative management. This would include the use of analgesic medication, anti-inflammatory medication, physiotherapy and chiropractic treatment for a period of at least six weeks before surgery is contemplated. 2. Pain that does not respond to any other treatment modality and is sufficiently severe to limit your daily activities and quality of life. This includes local neck pain, referred pain and radicular pain. 3. Muscle weakness due to nerve compression (radicular weakness). The most frequently performed operation is called an anterior cervical discectomy. Other operations that are performed include laminectomy and foraminotomy. Does this treatment have any complications? There are no real complications regarding conservative management of a cervical slipped disc beyond the fact that the clinical effects may increase, leading to surgery. The surgical management carries rare, but potentially serious complications. The section Your Neck Operation contains more specific detail and you should discuss this with your specialist. Some of the most feared risks would include nerve damage, which may be damage to the nerves leaving the spinal canal or damage to the spinal cord itself. The potential effects of this could be partial or complete dysfunction of these nerves and can include numbness, pain, weakness of the muscles or complete paralysis of one or more muscle groups. Infection and the formation of blood clots are also possible complications. Speech impediments can be caused by traction or damage to certain nerves. What are the long-term expectations? In cases where the symptoms settle with conservative measures, the symptoms may reappear at some stage. This can, however, take several years, but relief may be short lived. In cases where a discectomy and fusion are performed, the symptoms are usually relieved immediately in almost all patients and improvement is usually permanent.